The Federal Aviation Administration on Wednesday grounded all Boeing 787 planes operated by U.S. carriers until the aircraft, also known as Dreamliners, are proven to be safe to fly. United is the only U.S. carrier now operating 787s and has six of the innovative jets. The FAA's action follows a number of high-profile incidents with the new aircraft over the past week, including fuel leaks, a battery fire, a wiring problem and a brake computer glitch. "We've had two incidents involving batteries, involving charging circuits that are under question that have resulted in one case in a fire, in one case of smoke," said John Cox, NBC News aviation analyst. In a statement, the FAA said it will issue an emergency airworthiness directive to address a potential battery fire risk in the 787s. Before further flight, the agency will require Boeing to demonstrate that the batteries in the planes are safe. United told NBC News in a statement that it will comply with the airworthiness directive. "We will work closely with the FAA and Boeing on the technical review as we work toward restoring 787 service." The airline said it would begin accommodating customers on other aircraft. Boeing told NBC News that it is cooperating with the FAA. "We are confident the 787 is safe and we stand behind its overall integrity," said Boeing Chairman, President and CEO Jim McNerney in a statement. "We will be taking every necessary step in the coming days to assure our customers and the traveling public of the 787's safety and to return the airplanes to service." 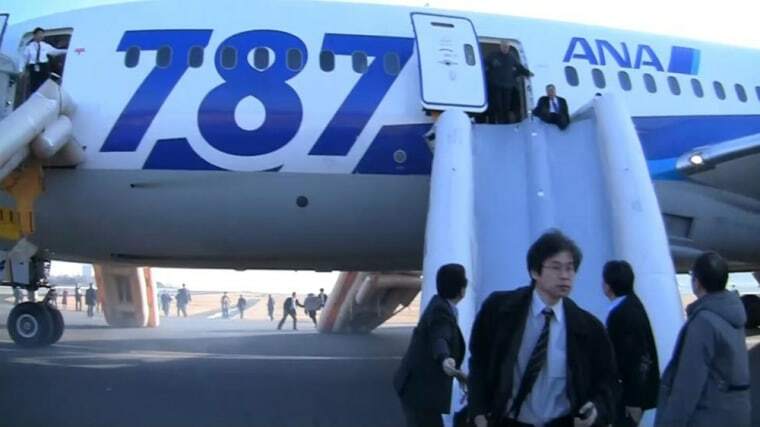 Earlier Wednesday, Japan's two leading airlines grounded their Boeing 787 fleets after one of the passenger jets made an emergency landing. The moves will make Japan a test case for how Boeing customers respond to safety concerns surrounding the Dreamliner 787, the pride of Boeing's passenger jet fleet, airline industry watchers said. Japan Airlines (JAL) and All Nippon Airways (ANA) operate about half of the 50 new Dreamliners so far delivered by Boeing, and focus is firmly on Japan and what steps Boeing takes there to allay safety concerns. "The most number of 787s in service are in Japan right now, therefore that is a big market for Boeing. A lot of the existing Boeing customers will be looking to see what action is taken in Japan in particular before they decide what action they are going to take with their orders," said Siva Govindasamy, Asia managing editor at Flightglobal, an industry news service. "You can be pretty sure that 1-2 of those customers are already in talks with Boeing to see what is going on and to rectify any issues before they get their aircraft. That's going to be very crucial right now, so the onus is on Boeing to take action," he said. India's aviation regulator said on Wednesday that it would decide whether or not to ground the Dreamliner jets only after Boeing submitted its safety report. State-owned Air India has six Dreamliners in its fleet. Australian carrier Qantas said its orders for 15 Boeing Dreamliner remain on track. A senior Boeing engineer said last week that the plane maker had confidence in the Dreamliner despite recent mishaps that included a battery fire. Still, industry watchers urged Boeing to take no risks with the Dreamliner and to take more steps straight away to assuage the safety concerns. "This problem (with the Dreamliner) looks to be systemic, it looks to be recurring. In that respect, my view is ….that they should consider grounding the entire Dreamliner fleet, not only limited to Japan but globally," Jonathan Galaviz, managing director & chief economist at Galaviz & Company told CNBC'S "Capital Connection." CNBC's Dhara Ranasinghe contributed to this report.